Another place I've always wanted to visit is Chicago and it was all I could have hoped for. We decided to splurge on our hotel and book a room right downtown (where valet parking was $59 overnight). Thanks to the Hotels.com app we cashed in our free night and got to stay in the heart of the city. ^^we first explored the city on an evening run. 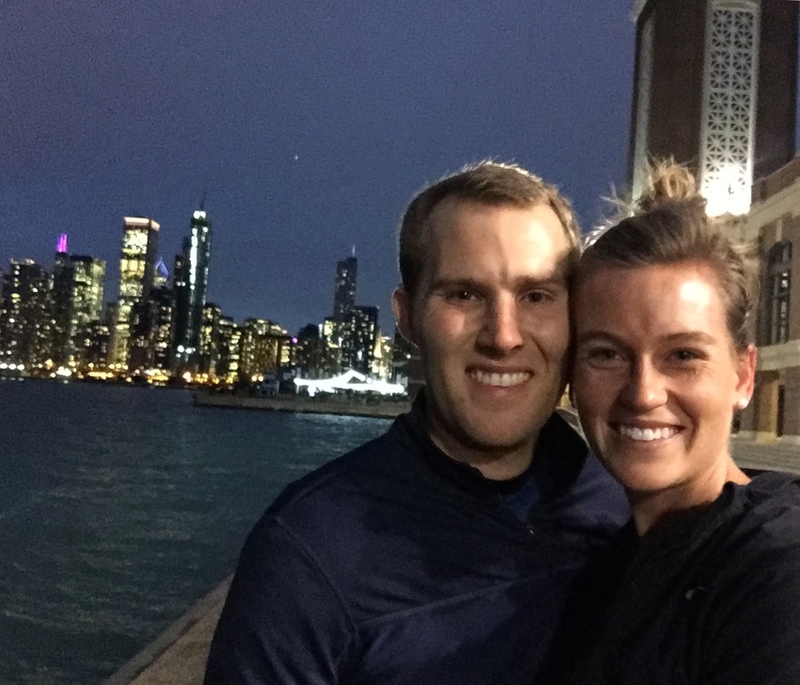 We ran down the Navy Pier and couldn't believe the view when we headed back. 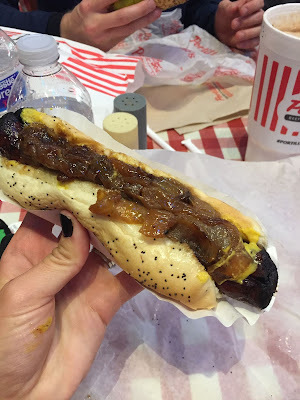 ^^and...we than ran straight to Chicago dogs at Portillo's for dinner. I ordered the Maxwell St. polish dog, Rich ate his and then ordered one of mine for himself. We also ordered a chocolate cake shake and it was huge. Little did we know the bottom half was actually their famous chocolate cake. I dare say this was my favorite meal of the whole trip. You know it's a good hotel when they have hot chocolate, crushed oreos, whip cream and chocolate syrup ready for you at the continental breakfast and we made sure to fill up before our final day of vacation and eating whatever we wanted. ^^The Cloud at Millennium park was our first stop and we were the only ones there-- it was awesome! I got a little motion sick walking under the mirrored bean and the whole concept is pretty unique if you think about it. One of those building is the Tribune Tower. Walking by you can see hundreds of pieces of stone, brick, petrified rock and other artifacts from around the world. We saw segments from the Salt Lake Temple, Berlin Wall, The White House, Great Pyramids (!! ), Tai Mahal, Parthenon, Sydney Opera House, Craters of the Moon, Great Wall of China and 150 other artifacts! What a treasure. ^^Lou Malnati's deep dish was the perfect last meal together. ^^our final picture of our 7 day, 14 states (12 new ones), 1 new country, 2,450 mile road trip as Rich and Erica. Thanks Ellen and Ernie for watching the kids and thanks babe for being my favorite person to make dreams come true with. Only ONE more state and then Rich and I will have visited all 48 states in the Continental United States together!